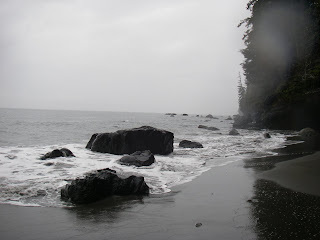 Somewhere west of Jordan River on Juan de Fuca Strait, possibly Bear Beach. This was back in March 07. On the way back I tried to shoot some photos of a water fall coming off a cliff - only to get knocked about by the only wave in the previous three hours. I kept the boat off the cliff but lost my hat and camera from the paddle mount. Stored the camera and went back in for the hat when the second wave tryed to turn me into a cliff decal.